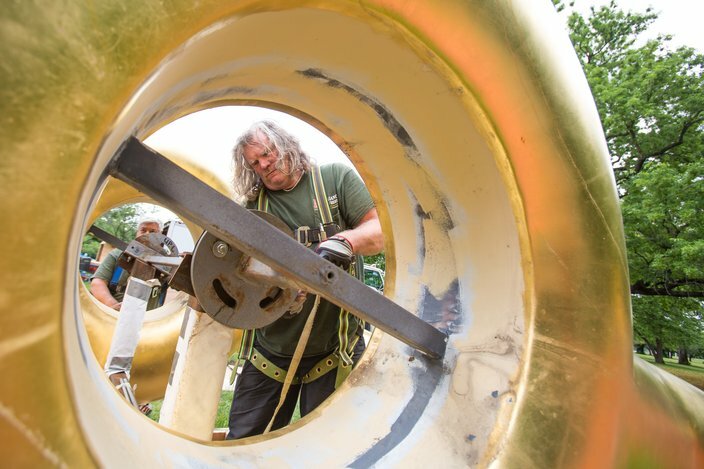 Workers begin to raise the gold-leafed shackle to the body of the 'Big Bling' sculpture along Kelly Drive, Wednesday, May 24, 2017. 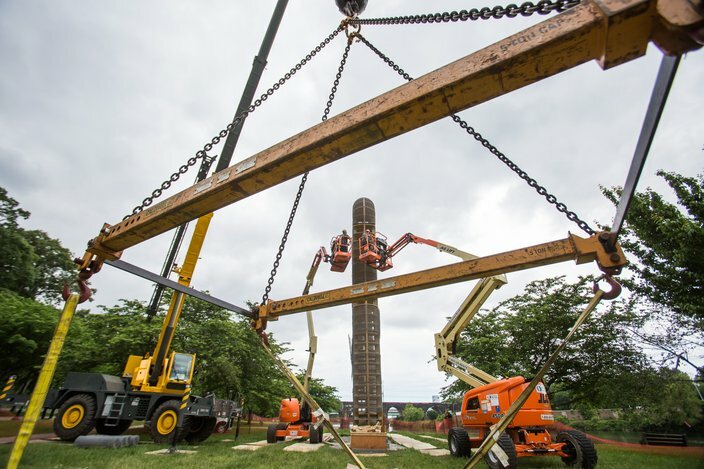 The Association For Public Art has largely-funded a new sculpture along Kelly Drive from artist Martin Puryear. 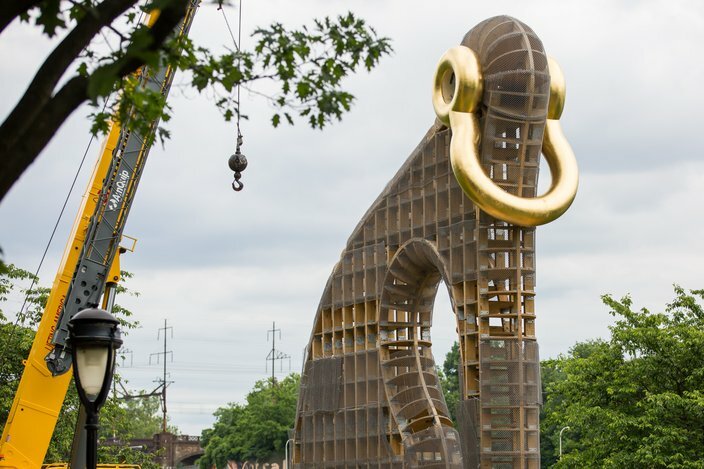 The piece of art entitled, ‘Big Bling’ will occupy a piece of land along the Schuylkill River between the Girard Avenue Bridge and the intersection of Fountain Green Drive. The 40-foot-high sculpture is made largely of wood and chain-linked fence, and is adorned with a giant gold-leafed shackle. 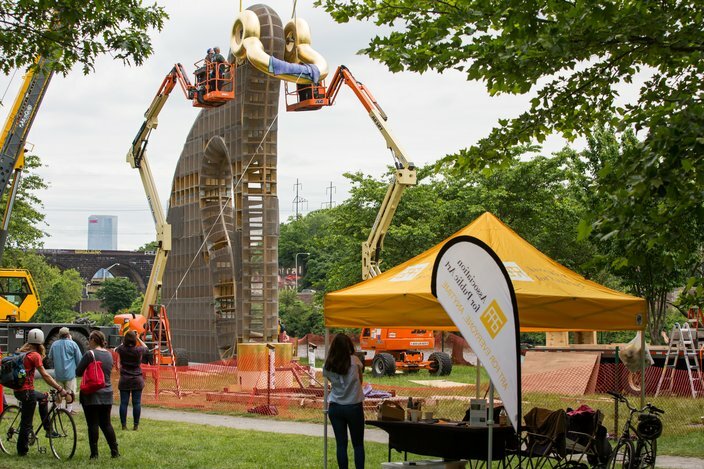 A free public celebration welcoming 'Big Bling' to Philadelphia will be held Thursday, June 8, 2017, from 4:30 p.m. to 7 p.m. You can register to attend the event here. Below is a series of photos during installation of the gold-leafed shackle. 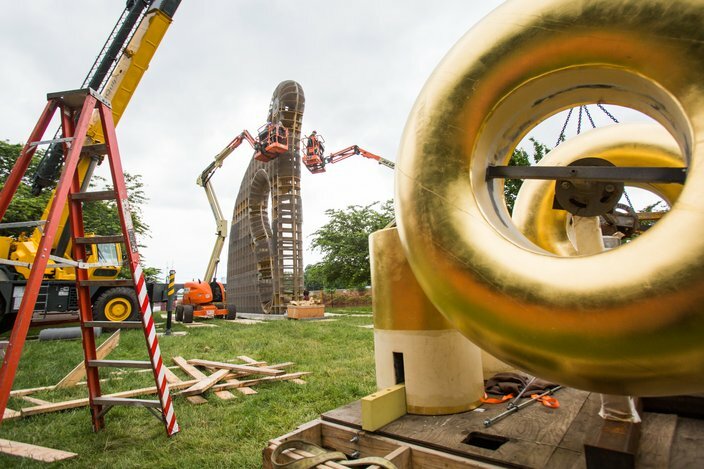 The large bracket attached to a crane will be used to hoist the gold-leafed shackle into position where it will be attached to the body of the 'Big Bling' sculpture, Wednesday, May 25, 2017. 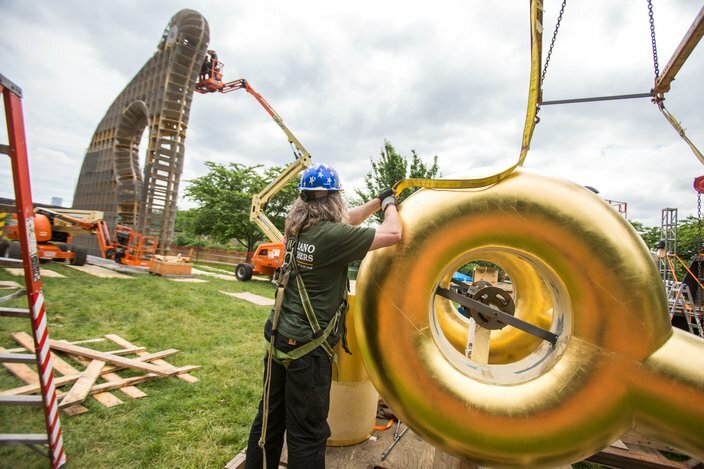 Installation crews prepare the main body of the 'Big Bling' sculpture along Kelly Drive in Philadelphia, moments before the gold-leafed shackle will be affixed to the sculpture. Workers prepare the 'Big Bling' sculpture for the addition of the gold-leafed shackle, Wednesday, May 24, 2017. 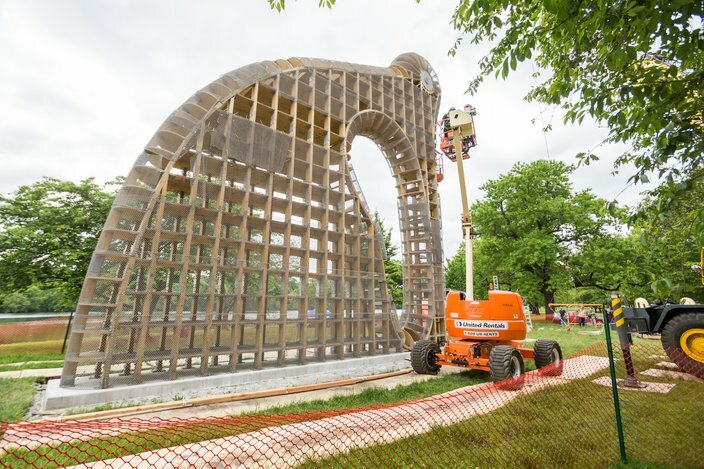 The new sculpture along Kelly Drive will be in place until November, 2017. 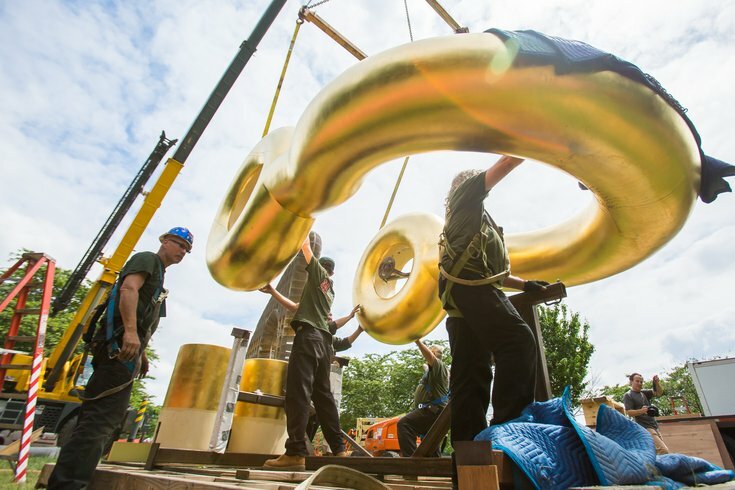 Workers attach straps and a bracket to the gold-leafed shackle moments before hoisting it into position on the body of the sculpture. Workers prepare the shackle before it is installed on the sculpture along Kelly Drive, Wednesday, May 24, 2017. 'Big Bling' was funded largely by the private non-profit the Association of Public Art. The sculpture is located along Kelly Drive between the Girard Avenue bridge and Fountain Green Drive. 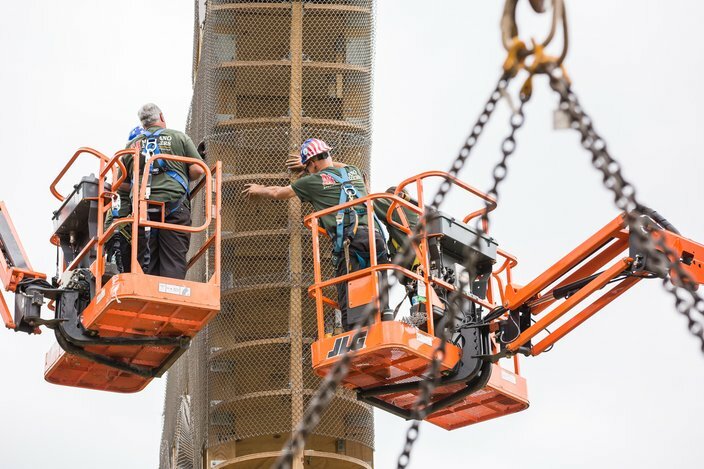 The installation was expected to be completed by Friday, May 26, 2017.